Looking For A Mobile Disco In Oxted? Mobile discos in Oxted from JMF Disco will provide you with a good experienced Mobile DJ hire - get a quote for a great party here. JMF Disco will provide the perfect solution for your party entertainment, with a reliable, experienced, professional DJ hire service, providing all the help you need with planning the ‘formalities’ and providing you and your guests with a great party which will be the perfect ending to your special day using our Mobile Disco Oxted service. JMF Discos mobile disco hire service will provide you with the perfect entertainment you want for your dream celebration at any venue in Oxted and the surrounding areas  why settle for anything less? JMF Disco can provide a range of mobile discos and mobile djs, so will provide the perfect solution for your party entertainment, with a reliable, experienced, professional DJ hire service, providing all the help you need with planning the formalities and providing you and your guests with great party entertainers which will be the perfect ending to your special day using our Mobile Disco Oxted service. We have developed our childrens discos by offering a great school disco dj hire or school prom DJ service. We are fully insured, our equipment is PAT Tested, our Disc Jockeys are DBS checked, we can work in with any payment systems you have in place, we only play clean radio edits of songs and we will make it as easy as possible to help you arrange a great PTA Disco or school disco that the children will always remember  check out our School disco page for more details. 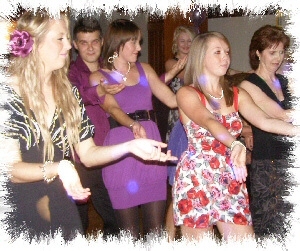 JMF Discos party dj hire service can cater for most events. Doing it right requires an experienced DJ with the right skills and resources that we will bring to your celebration by using our Mobile Disco Oxted service. Contact John on Tel 01795 429777, Mobile 07895 546183 or by email to discuss your Mobile Disco Oxted service needs or questions. - I'm sure I can provide you with the mobile discos in Oxted you really want!